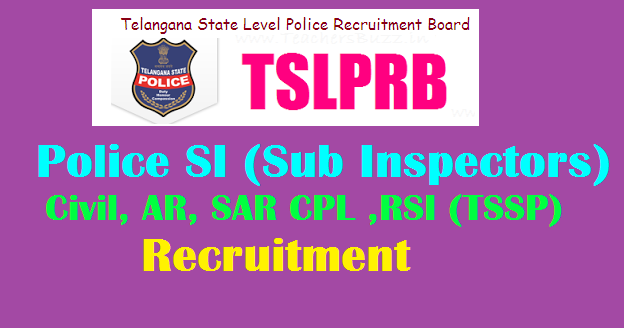 The Telangana State Level Police Recruitment Board (TSLPRB) invites Applications through ONLINE mode only in the prescribed proforma which will be made available on Website (www.tslprb.in) from 09-06-2018 to 30-06-2018 for recruitment to the following Posts. The upper age limit will be relaxable as described in the Notification. as being equivalent to Intermediate and should have studied 3 years Degree course. Fee: Candidates with local candidature of Telangana belonging to OCs and BCs applying for the Posts of SI Civil or equivalent viz., SCT SI (Civil / AR / SAR CPL / TSSP), SFO in TS Disaster Response & Fire Services Department and Deputy Jailor / Assistant Matron in Prisons & Correctional Services Department have to pay a fee of Rs.1,000/- towards Registration of the Application, Processing of Application, Conduct of Tests and Examinations, Maintenance of Portal etc., Local Candidates of Telangana belonging to SCs and STs have to however, pay only Rs.500/- towards the same. All other Candidates will have to pay Rs.1,000/-. Fee may be paid at TS Online / AP Online / MeeSeva (e-Seva) Centres / through Payment Gateway (Credit Card / Debit Card / Internet Banking).